This article is about the medical specialty dealing with the heart. For the album by Good Charlotte, see Cardiology (album). For the medical journal, see Cardiology (journal). Blood flow diagram of the human heart. Blue components indicate de-oxygenated blood pathways and red components indicate oxygenated blood pathways. Cardiology (from Greek καρδίᾱ kardiā, "heart" and -λογία -logia, "study") is a branch of medicine dealing with disorders of the heart as well as parts of the circulatory system. The field includes medical diagnosis and treatment of congenital heart defects, coronary artery disease, heart failure, valvular heart disease and electrophysiology. Physicians who specialize in this field of medicine are called cardiologists, a specialty of internal medicine. Pediatric cardiologists are pediatricians who specialize in cardiology. Physicians who specialize in cardiac surgery are called cardiothoracic surgeons or cardiac surgeons, a specialty of general surgery. Although the cardiovascular system is inextricably linked to blood, cardiology is relatively unconcerned with hematology and its diseases. Some obvious exceptions that affect the function of the heart would be blood tests (electrolyte disturbances, troponins), decreased oxygen carrying capacity (anemia, hypovolemic shock), and coagulopathies. All cardiologists study the disorders of the heart, but the study of adult and child heart disorders are through different training pathways. Therefore, an adult cardiologist (often simply called "cardiologist") is inadequately trained to take care of children, and pediatric cardiologists are inadequately trained to take care of adults. The surgical aspects are not included in cardiology and are in the domain of cardiothoracic surgery. For example, coronary artery bypass surgery (CABG) and cardiopulmonary bypass are both surgical procedures performed by surgeons, not cardiologists. However the insertion of stents and pacemakers are performed by cardiologists. Cardiac electrophysiology: Study of the electrical properties and conduction diseases of the heart. Echocardiography: The use of ultrasound to study the mechanical function/physics of the heart. Interventional cardiology: The use of catheters for the treatment of structural and ischemic diseases of the heart. Nuclear cardiology: The use of nuclear medicine to visualize the uptake of an isotope by the heart using radioactive sources. Per doximity, adult cardiologists make an average of $436,849 in the United States. 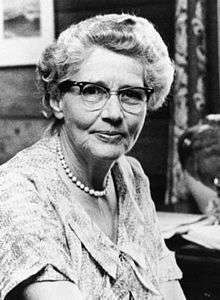 Helen B. Taussig is known as the founder of pediatric cardiology. She became famous through her work with Tetralogy of Fallot, a congenital heart defect in which oxygenated and deoxygenated blood enters the circulatory system resulting from aventricular septal defect (VSD) right beneath the aorta. This condition causes newborns to have a bluish-tint, cyanosis, and have a deficiency of oxygen to their tissues, hypoxemia. She worked with Alfred Blalock and Vivien Thomas at Johns Hopkins Hospital where they experimented with dogs to look at how they would attempt to surgically cure these "blue babies." They eventually figured out how to do just that by the anastomosis of the systemic artery to the pulmonary artery and called this the Blalock-Taussig Shunt. 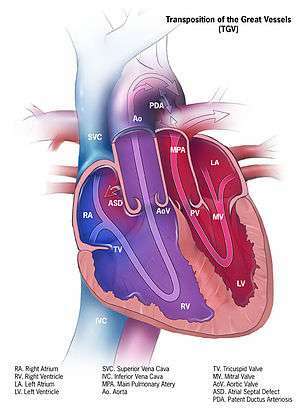 Tetralogy of Fallot, pulmonary atresia, double outlet right ventricle, transposition of the great arteries, persistent truncus arteriosus, and Ebsteins anomaly are various congenital cyanotic heart diseases. Congenital cyanotic heart diseases is where something is wrong with the heart of a newborn and it is not oxygenating the blood efficiently. Tetralogy of Fallot is the most common congenital heart disease arising in 1-3 cases per 1,000 births. The cause of this defect is a ventricular septal defect (VSD) and anoverriding aorta. These two defects combined causes deoxygenated blood to bypass the lungs and going right back into thecirculatory system. The modified Blalock-Taussig shunt is usually used to fix the circulation. This procedure is done by placing a graft between the subclavian artery and the ipsilateral pulmonary artery to restore the correct blood flow. Pulmonary Atresia happens in 7-8 per 100,000 births and is characterized by the aorta branching out of the right ventricle. This causes the deoxygenated blood to bypass the lungs and enter the circulatory system. Surgeries can fix this by redirecting the aorta and fixing the right ventricle and pulmonary artery connection. 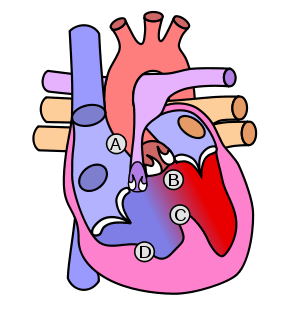 Double outlet right ventricle is when both great arteries, the pulmonary artery and the aorta, are connected to the right ventricle. There is usually a VSD in different particular places depending on the variations of DORV, typically 50% are subaortic and 30%. The surgeries that can be done to fix this defect can vary due to the different physiology and blood flow in the defected heart. One way it can be cured is by a VSD closure and placing conduits to restart the blood flow between the left ventricle and the aorta and between the right ventricle and the pulmonary artery. Another way is systemic-to-pulmonary artery shunt in cases associated with pulmonary stenosis. Also, a balloon atrial septostomy can be done to fix DORV with the Taussig-Bing anomaly. There are two different types of transposition of the great arteries, Dextro-transposition of the great arteries and Levo-transposition of the great arteries, depending on where the chambers and vessels connect. Dextro-transposition happens in about 1 in 4,000 newborns and is when the right ventricle pumps blood into the aorta and deoxygenated blood enters the blood stream. The temporary procedure is to create an atrial septal defect (ASD). A permanent fix is more complicated and involves redirecting the pulmonary return to the right atrium and the systemic return to the left atrium, which is known as the Senning procedure. The Rastelli procedure can also be done by rerouting the left ventricular outflow, dividing the pulmonary trunk, and placing a conduit in between the right ventricle and pulmonary trunk. Levo-transposition happens in about 1 in 13,000 newborns and is characterized by the left ventricle pumping blood into the lungs and the right ventricle pumping the blood into the aorta. This may not produce problems at the beginning, but will eventually due to the different pressures each ventricle uses to pump blood. Switching the left ventricle to be the systemic ventricle and the right ventricle to pump blood into the pulmonary artery can repair levo-transposition. Persistent truncus arteriosus is when the truncus arteriosus fails to split into the aorta and pulmonary trunk. This occurs in about 1 in 11,000 live births and allows both oxygenated and deoxygenated blood into the body. The repair consists of a VSD closure and the Rastelli procedure. Ebstein's anomaly is when the right atrium is significantly enlarged and the heart is shaped like a box. This is very rare and happens in less than 1% in congenital heart disease cases. The surgical repair varies depending on the seriousness of the disease. Pediatric cardiology is a specialty of pediatrics. To be a pediatric cardiologist in the United States, it is required that a three-year residency in pediatrics is followed by a three-year fellowship in pediatric cardiology. Per doximity, pediatric cardiologists make an average of $303,917 in the United States. As the center focus of cardiology, the heart has numerous anatomical features (e.g., atria, ventricles, heart valves) and numerous physiological features (e.g., systole, heart sounds, afterload) that have been encyclopedically documented for many centuries. Disorders of the heart lead to heart disease and cardiovascular disease and can lead to a significant number of deaths: cardiovascular disease is the leading cause of death in the United States and caused 24.95% of total deaths in 2008. The primary responsibility of the heart is to pump blood throughout the body. It pumps blood from the body — called the systemic circulation — through the lungs — called the pulmonary circulation — and then back out to the body. This means that the heart is connected to and affects the entirety of the body. 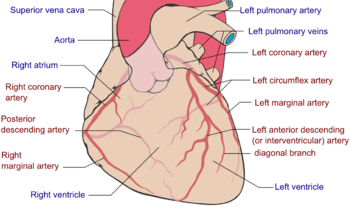 Simplified, the heart is a circuit of the Circulation. While plenty is known about the healthy heart, the bulk of study in cardiology is in disorders of the heart and restoration, and where possible, of function. The heart is a muscle that squeezes blood and functions like a pump. Each part of the heart is susceptible to failure or dysfunction and the heart can be divided into the mechanical and the electrical parts. The electrical part of the heart is centered on the periodic contraction (squeezing) of the muscle cells that is caused by the cardiac pacemaker located in the sinoatrial node. The study of the electrical aspects is a sub-field of electrophysiology called cardiac electrophysiology and is epitomized with the electrocardiogram (ECG/EKG). The action potentials generated in the pacemaker propagate throughout the heart in a specific pattern. The system that carries this potential is called the electrical conduction system. Dysfunction of the electrical system manifests in many ways and may include Wolff–Parkinson–White syndrome, ventricular fibrillation, and heart block. 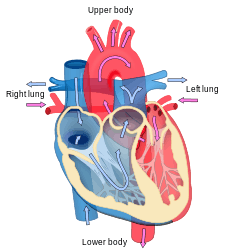 The mechanical part of the heart is centered on the fluidic movement of blood and the functionality of the heart as a pump. The mechanical part is ultimately the purpose of the heart and many of the disorders of the heart disrupt the ability to move blood. Failure to move sufficient blood can result in failure in other organs and may result in death if severe. Heart failure is one condition in which the mechanical properties of the heart have failed or are failing, which means insufficient blood is being circulated. The cardiac physical exam focuses on portions of the physical exam that elucidate information about diseases and disorders outlined below. Clinical judgment, of course, should guide the physical exam but the following are pertinent things related to a general / broad cardiac exam. Scars indicating procedures: sternotomy, thoracotomy, pericardial window, carotid endarterectomy, thyroidectomy, etc. Cardiology is concerned with the normal functionality of the heart and the deviation from a healthy heart. Many disorders involve the heart itself but some are outside of the heart and in the vascular system. Collectively, the two together is termed the cardiovascular system and diseases of one part tends to affect the other part. The following attempts to categorize the lengthy list of disorders & diseases of the cardiovascular system, but there is overlap and a single entity may appear in multiple areas. Hypertension is elevated blood pressure above "normal." Blood pressure is reported as fraction of systolic blood pressure over diastolic blood pressure and typically at the brachial artery while seated and measured in mmHg. The normal blood pressure changes with age with a general trend that it increases with age. Normal pressure for newborns is around 90/60 and young adults classically being 120/80 (pronounced "120 over 80"). Hypertension has significant impact on the cardiovascular system — other systems too — and is the motivating reason for treatment. Reduction of morbidity from hypertension is the end-goal of therapy. Hypertension with no known cause, which is about 90–95% of people with hypertension. Often thought to be due to lifestyle. Management is through medications and blood pressure that does not respond is a red flag that it may be secondary hypertension. Due to the widespread nature of hypertension, cardiologists will end up managing or recommending treatments for essential hypertension. Most causes of secondary hypertension are from kidney and endocrine disorders. Cardiovascular causes of hypertension include coarctation of aorta, atherosclerosis, and aortic stenosis. Increased pressure results in hypertrophy of the myocardium, particularly left ventricular hypertrophy. Pulmonary hypertension — which is separate from "hypertension" described above — can result in right ventricular hypertrophy. Generally considered to be a systolic blood pressure over 180. If there is no organ dysfunction it is called a hypertensive urgency, but if there is (e.g., confusion, breathlessness) then it is called hypertensive emergency. PreE is a disease of pregnancy that results in hypertension and proteinuria. PreE has negative consequences for both the mother and fetus/baby. Progression to eclampsia involves seizures. Currently, the only definitive treatment is delivery of the fetus. Infarction of the brain due to internal bleeding from Charcot–Bouchard aneurysms. Damage to organs from chronic hypertension. Proper function of the heart relies on a healthy Electrical conduction system of the heart and an orderly transmission of the action potentials that signal the myocardium to contract. Cardiac arrhythmias have numerous causes and have varying outcomes and complications. Fibrillation of the atria is fairly common and more common with increased age and overall disease of the heart. If the ventricular rate exceeds 100 then the afib is further classified as "afib with RVR" meaning rapid ventricular response. A re-entrant tachycardia greater than 240 beats per minute and produces a characteristic saw-tooth pattern on ECG. It often degenerates to atrial fibrillation. A decrease in the ability of the conduction system to transmit action pulses in the orderly manner. Blockage of the signal at different areas results in different types of heart block (e.g., first-degree AV block, left bundle branch block). Lengthening of the QT interval can result in arrhythmias and sudden cardiac death. Specifically, it can lead to torsades de pointes than can then lead to ventricular fibrillation. It can be an inherited disorder or be acquired. Certain medications are associated with lengthening of the QT interval — drug-induced QT prolongation — and an EKG may be warranted before starting the medication to ensure a normal QT interval, but this practice is debated. Normal beats originate in the SA node and extra beats originating from the atria are called PACs. They can be found in normal hearts and be asymptomatic; symptomatic PACs can be treated with beta blockers. PACs, like PVCs, can pair up with normal beats in a pattern called bigeminy. Normal beats are conducted through the AV node to the ventricles resulting in a narrow QRS complex. With PVCs, the extra beat originates within the ventricles and results in a wide QRS complex. Like PACs, they can be found in healthy hearts but are more likely to be found in bigeminy than PACs. Disease of the SA node that results in irregular changes in heart rate and in the case of BTS the arrhythmia alternates between bradycardia and tachycardia. 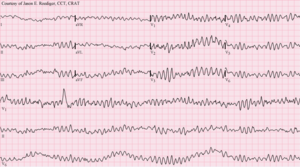 A collection of tachycardia rhythms that originate before the ventricles and include the SA node, atria, and AV node. It is a broad, encomparsing term that includes other rhythms in this list (e.g., afib with RVR) and others. Fibrillation of the ventricles is a life-threatening arrhythmia and should be treated by defibrillation and is a medical emergency. Vfib results from uncoordinated contraction of the ventricles and defibrillation acts as a 'reset' to synchronize contraction (i.e., a normal rhythm). Tachycardia that originates from within the ventricles. Typically, "vtach" implies monomorphology but it can be an umbrella term for both monomorphic and polymorphic (i.e., torsade de pointes). To classify a ventricular rhythm as vtach, at least 3 beats in a row must originate from the ventricles and have a rate over 100. If it lasts longer than 30 seconds, it can additionally be labelled as a sustained vtach. Coronary arteries labeled in red text and other landmarks in blue text. Contrary to a basic understanding of the cardiovascular system, the heart cannot itself receive enough oxygen and nutrients from the blood it pumps and it must be supplied with blood as if it were any other organ in the body. Unlike the systemic organs the heart receives perfusion in the phase of diastole rather than systole. This circulation of blood is called the coronary circulation. The coronary circulation consists of coronary arteries and coronary veins. The two main coronary arteries — right coronary artery (RCA) and left coronary artery (LCA) — branch off of the ascending aorta and the left further branches into the left circumflex artery (LCx) and left anterior descending artery (LAD). Combined, the RCA, LCx, and LAD comprise the three main coronary arteries (e.g., "three vessel disease"). Lastly, the posterior descending artery (PDA) is supplied by the RCA and/or LCx, and this connection determines the "dominance" of the heart (e.g., if the RCA supplies the PDA then the heart is "right dominant"). Disorders of the coronary circulation can have devastating effects to the heart that results in a downward spiral of worse circulation leading to worse heart function leading to worse circulation and so on. ACS is a medical emergency and is a broad term encompassing many acute myocardial infarction symptoms. As a syndrome, it consists of a constellation of symptoms and can have many causes. The top three causes of ACS are ST elevation myocardial infarction (STEMI, 30%), non ST elevation myocardial infarction (NSTEMI, 25%), or unstable angina (38%). The first two are myocardial infarctions which are more commonly known as "heart attacks." Angina pectoris literally means "chest pain" that refers to pain caused by ischemia of the heart. The main cause of angina is coronary artery disease, but can result from other non-atherosclerotic causes such as anemia and heart failure. Stable angina results if the angina resolves with rest or nitroglycerin, but can progress to unstable angina which is a form of acute coronary syndrome. Atherosclerosis is the condition in which an artery wall thickens as the result of a build-up of fatty materials (e.g., cholesterol) and white blood cells ("foam cells"). Atherosclerosis of a coronary artery leads to coronary artery disease (CAD). Atherosclerosis is a broad term referring to loss of elasticity of arteries and more specific terms exist — arteriosclerosis and arteriolosclerosis — to narrow which arteries are diseased and can easily be confused due to similar spelling. Overall, atherosclerosis tends to affect the arteries of highest pressure: aorta, coronary, renal, femoral, cerebral, and carotid. Coronary artery disease is a general term for any reduction in coronary circulation. One such cause is atherosclerosis. CAD can lead to ischemia (angina pectoris) or infarction (myocardial infarction). Treatment of CAD includes angioplasty, stenting, and coronary artery bypass surgery (CABG). A myocardial infarction is the death of a part of the heart which is typically caused by a blockage of the coronary circulation but can be caused by other insufficiency such as cardiogenic shock. Recurrence of stenosis after being treated (e.g., stenting). A rhythm strip showing a couple beats of normal sinus rhythm followed by an atrial beat and asystole ("flatline"). Cardiac arrest refers to the cessation of normal systemic circulation due to failure in proper contraction of the heart. There are several conditions that can cause cardiac arrest. Treatment of cardiac arrest includes cardiopulmonary resuscitation (CPR), defibrillation, and advanced cardiac life support (ACLS), and treatment of the underlying cause of arrest. Asystole refers to the absence of electrical activity of the heart and is sometimes referred to as a "flatline" because the electrocardiogram shows a solid line due to the absence of electrical activity. This flatline is commonly used in television and movies to signal death. There are numerous causes of asystole that may be reversible if determined quickly enough, however, survival is very unlikely (~2% if not in a hospital). In contrast, asystole is desired and induced during cardiopulmonary bypass through a cardioplegia solution containing very high amounts of potassium. One additional example is the use of high potassium in lethal injection that results in asystole, cardiac arrest, and then death. Pulseless electrical activity is when the electrocardiogram shows a rhythm that should produce a pulse but it does not. PEA is commonly caused by the 6 H's and 6 T's (see PEA article) and results in decreased cardiac output and insufficient oxygen delivery to the body. Pulseless ventricular tachycardia (VT) Is one classification of VT such that no pulse is felt because of an ineffective cardiac output which causes cardiac arrest, which also results in insufficient oxygen delivery to the body. Sudden cardiac death is a concept of natural death rather than a specific medical condition. There are several causes of sudden cardiac death and it is distinct from cardiac arrest. The leading cause of SCD in young athletes is hypertrophic cardiomyopathy but can also result from commotio cordis that is often sustained during athletic activity. Ventricular fibrillation is fibrillation of the ventricles of the heart. Rhythmic contraction is necessary for efficient movement of blood, and fibrillation disrupts this rhythm sufficiently to cause cardiac arrest. 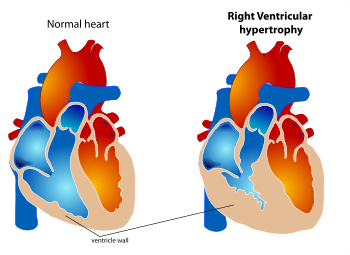 The diagram shows a healthy heart (left) and one suffering from right ventricular hypertrophy (right). A man with congestive heart failure and marked jugular venous distension. External jugular vein marked by an arrow. 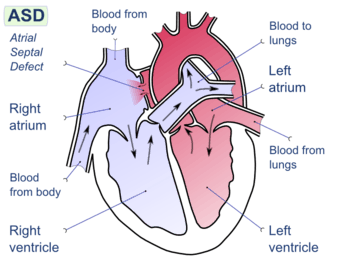 The layer of the heart responsible for mechanical function is the myocardium. The myocardium is sandwiched between two thin layers — the epicardium & endocardium — and is composed of a special type of muscle cell called cardiomyocytes. Disorders of these cells results in dysfunction of the structure and function of the heart. Cardiomyopathy is a deterioration of the myocardium. Several classifications have been used to categorize cardiomyopathies with the most common being primary vs. secondary, and dilated vs. restrictive vs. hypertrophic (presented below). Cardiomyopathy causing ischemia of the heart due to coronary artery disease. Cardiomyopathy caused by something other than ischemia. Cardiomyopathy caused by hypertrophy of the heart and is the leading cause of sudden cardiac death in young adults. Cardiomyopathy caused by dilation of the heart, typically caused by "drugs and bugs." It is the most common form of non-ischemic cardiomyopathy and the dilitation of the heart results in larger chamber volumes & thinner myocardial walls, both of which decrease the ability to pump. Specific kinds of dilated cardiomyopathy are listed below, and other causes include Chagas disease, chemotherapeutic agents (e.g., doxorubicin), tuberculosis, and pregnancy. A type of dilated cardiomyopathy caused by chronic abuse of alcohol and results from direct toxicity of ethanol on the myocardium. A type of dilated cardiomyopathy caused by chronic tachycardia. A common arrhythmia that can lead to this form of cardiomyopathy is the common atrial fibrillation. A type of dilated cardiomyopathy caused by a sudden temporary weakening of the myocardium, which can include emotional stress (i.e. broken-heart syndrome). It presents as sudden heart failure with ECG changes similarly found in myocardial infarction and typically is found in post-menopausal women. Cardiomyopathy caused by a genetic mutation of the desmosomes that connect myocytes. Cardiomyopathy caused by excessive rigidity of the heart that prevents effective contraction and pumping. In comparison to DCM, RCM is often secondarily caused by other diseases such as amyloidosis, scleroderma, hemachromatosis (iron overload) and eosinophilic granulomatosis with polyangiitis. As such, the treatment for RCM is to treat the disease causing the RCM. Heart failure is failure of the heart to produce sufficient blood flow to meet metabolic demands of the body, or to do so at higher filling pressures. The hallmark signs of heart failure include shortness of breath (especially on exertion, at night, or while lying down) and leg swelling. Chest pain is rarely a feature of heart failure, which would point a diagnosis more toward angina pectoris or myocardial infarction. Perhaps confusingly, heart failure can be caused by coronary artery disease (CAD) and myocardial infarction (MI) that result in a deficiency in pumping that then leads to heart failure. Treatment of heart failure, like most secondary disorders, depends upon treatment of the primary cause which includes CAD & MI but also valvular problems like aortic stenosis and hypertension. Untreated cor pulmonale can cause right heart failure from chronic pulmonary hypertrophy. Hypertrophy of the ventricle. Thickening of the myocardium (i.e., hypertrophy) can be physiological (a normal response) or pathological. An example of physiological hypertrophy is the result of significant athletic training (athletic heart syndrome). Hypertrophy of the left ventricle is more common than in the right and typically due to increased afterload on the heart such as from hypertension and aortic stenosis, but also from long standing mitral valve regurgitation. It can be diagnosed by echocardiography or ECG. Hypertrophy of the right ventricle and, it too, can be physiological from athletic training. Other causes include pulmonary hypertension and COPD as well as several congenital heart defects like ventricular septal defect, Tetralogy of Fallot and hypoplastic left heart syndrome. Cancer of the heart is very rare and those cancers tend to be benign. Most common tumor of the heart. It is a benign tumor most commonly found in the left atrium and can be associated with Carney syndrome. Rupture is a gross structural failure of the heart. Commonly a result of myocardial infarction that weakens the wall sufficiently to result in frank rupture and is typically seen 7–10 days after infarction. If not significant enough, the wall can develop into a ventricular aneurysm. Infection and inflammation of the myocardium is myocarditis. Most causes are infectious (parvovirus B19, Lyme disease, Chagas disease), toxic (ethanol, anthracyclines, clozipine), or immunologic (systemic lupus erythematosus, sarcoidosis, and some of the vasculitidies (see below)). Definitive diagnosis requires a biopsy. A congenital heart defect in which the right ventricular myocardium is too thin or absent. It is a very rare disorder. Posterior wall of the pericardial sac. 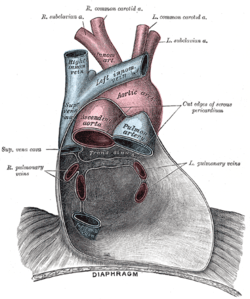 The pericardium is a double-walled sac — fibrous pericardium and serous pericardium — that contains the heart. The serous pericardium — like other similar structures (e.g., pulmonary pleurae, synovium, bursae) — contains a thin layer of fluid that reduces friction from movement. The fibrous pericardium fixes the heart in the mediastinum. Inflammation of the pericardium that is typically idiopathic or infectious in nature. Treatment of viral & idiopathic pericarditis is NSAIDs or aspirin. Pericarditis that constricts the expansion of the heart and inhibits heart function. Causes include infections (tuberculosis, fungus, parasites) and surgery. Definitive surgery is a pericardiectomy. A form of pericarditis that develops 2–3 weeks after myocardial infarction and is accompanied by fever, pleuritic chest pain, and symptoms of pericarditis. The serous pericardium normally contains fluid that reduces friction, but an abnormal accumulation of fluid in the pericardium is called a pericardial effusion. The list of causes is lengthy but includes pericarditis, rheumatic diseases (e.g., systemic lupus erythematosus), trauma, and blood from myocardial rupture. If an effusion worsens then the fluid can inhibit heart function and symptoms of cardiac tamponade appear. Treatment includes pericardiocentesis to drain the fluid, if necessary, and treatment of the underlying cause. Tamponade is a medical emergency resulting from accumulation of fluid in the pericardium that inhibits heart function. Tamponade is a consequence of the fibrous pericardium being too inelastic to permit adequate heart expansion during diastole. The classic finding is pulsus paradoxus as well as Beck's triad (low arterial blood pressure, distended neck veins, & soft heart sounds). Treatment is supportive until in a hospital where pericardiocentesis or a pericardial window can be performed to drain the fluid. 3D reconstruction of the heart as viewed from the apex towards the valves, image flipped 180° relative to illustration above. Pulmonary valve not visible, leaflets of the tricuspid and aortic valves only partly visible. To the left two images in 2D from the same dataset, showing tricuspid and mitral valves (above) and aortal and mitral valve (below). 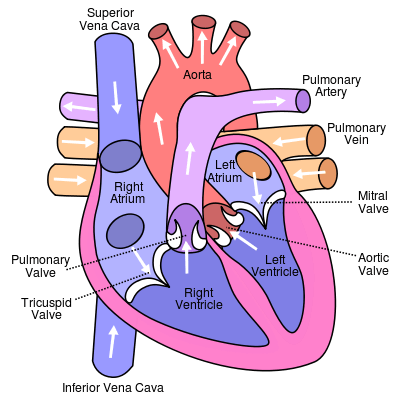 The heart contains four valves that direct the flow of blood in a single direction. Venous/deoxygenated blood returns to the heart through the tricuspid valve (TV) and pulmonary valve (PV); and arterial/oxygenated blood leaves the heart through the mitral valve (MV) and aortic valve (AV). Valves function to move blood in one direction only and failure to prevent back-flow is called regurgitation or insufficiency; and failure to easily move blood in the forward direction is through narrowing of the valve called stenosis. There are eight combinations of the four valves and two disorders. Specific problems of each valve. Disorders and treatments of the aortic valve that separates the left ventricle and aorta. Deficiency of the aortic valve that permits regurgitation from the aorta into the left ventricle. Narrowing of the aortic valve opening that reduces blood flow through the valve. Stenosis commonly occurs from calcification of the valve, which happens prematurely in those with a bicuspid aortic valve. Stenosis of the aortic valve produces a harsh systolic murmur that classically radiates in the carotid arteries as well as pulsus parvus et tardus. Replacement of the aortic valve due to aortic regurgitation, aortic stenosis, or other reasons. A special kind of replacement called percutaneous aortic valve replacement is done through catheters are does not require open-heart surgery. Repair, instead of replacement, of the aortic valve. Repair of the valve by using a balloon catheter to force it open. Disorders and treatments of the mitral valve that separates the left atrium and left ventricle. Prolapse of the mitral valve into the left atrium during ventricular systole. Deficiency of the mitral valve that permits regurgitation from the left ventricle into the left atrium. Regurgitation produces a systolic murmur that radiates into the axilla. Narrowing of the mitral valve opening that reduces blood flow through the valve. Replacement of the mitral valve due to mitral regurgitation, mitral stenosis, or other reasons. Repair, instead of replacement, of the mitral valve. Disorders of the pulmonary valve that separates the right ventricle and pulmonary artery. Deficiency of the pulmonary valve that permits regurgitation from the pulmonary artery into the right ventricle. Narrowing of the pulmonary valve opening that reduces blood flow through the valve. Disorders of the tricuspid valve that separates the right atrium and right ventricle. Deficiency of the tricuspid valve that permits regurgitation from the right ventricle into the right atrium. Narrowing of the tricuspid valve opening that reduces blood flow through the valve. A congenital heart defect that results in the tricuspid valve leaflets being deeper in the heart (toward the apex) than normal. The annulus of the valve is in the correct position, however, and the portion of the ventricle affected becomes "atrialized" with thinner walls. The right atrium becomes hypertrophied and can result in conduction defects (e.g., Wolff–Parkinson–White syndrome). The thin, inner lining of the heart is the endocardium and inflammation of this layer is called endocarditis. Endocarditis commonly affects the heart valves. Commonly affects the valves due to absence of blood supply to the heart valve, which results in a decreased immune response to the valve leaflets. Typically, bacteria cause infective endocarditis of the mitral valve, but intravenous drug users (e.g., heroin, methamphetamine) have an increased risk of infection of the tricuspid valve. Common signs include Janeway lesions (non-tender), Osler's nodes (tender), and splinter hemorrage of the nails. Growths on the valves that are not from an infectious source and are composed of fibrin and platelets, and is associated with a history of rheumatic fever. The aortic valve is the most common valve affected (followed by mitral, tricuspid, & then pulmonary). A form of nonbacterial endocarditis specific to systemic lupus erythematosus (SLE) and tends to affect the mitral valve (unlike NBTE which affects the aortic valve). It is the second most common heart finding in SLE after pericarditis. Atrial septal defect with left-to-right shunt. Congenital heart defects (CHD) are defects in the structure of the heart which are present at birth and are often the result of aberrant embryological development. Defects can be syndromic or non-syndromic, with the later meaning defects that are isolated and not found in patterns (i.e., a syndrome). The top two syndromic causes of CHD are Noonan syndrome and Down syndrome. Down syndrome is more common than Noonan syndrome, but has a lower incidence of CHD, which makes Noonan syndrome the most common syndromic cause of CHD. CHD should make one consider the VACTERL association, namely ASD, VSD, & ToF, and other syndromes like Noonan, Down, and DiGeorge syndromes. Listed below include congenital defects that do not affect the heart (e.g., CoA, PDA), but are included anyway because they affect the cardiovascular system. Defect in the interatrial septum that permits blood flow between atria, including a patent foramen ovale (PFO). Formation of two valve leaflets in the aortic valve instead of three leaflets. This leads to aortic stenosis as the valve prematurely calcifies (as compared to calcification of a trileflet valve). Narrowing of the aorta, typically of the aortic arch and is classically found in Turner syndrome. A "complete" coarction is called an interrupted aortic arch. A membrane that divides one of the atria results in "three" atria (hence "triatriatum"). This tends to affect the left atrium more than the right atrium. The membrane may be present without complete division of the atrium. It presents similarly to stenosis of the respective semilunar valve (i.e., tricuspid stenosis for right atrium). Dextrocardia is a condition in which the apex of the heart is on the right side of the body, instead of the left. This can exist in isolation or as a part of situs inversus in which the entire body is mirrored not just the heart. Situs inversus can be a part of primary ciliary dyskinesia (aka Kartagener syndrome) that has recurrent respiratory infections and male infertility. A simple chest xray is sufficient to diagnose dextrocardia, provided care is taken in marking the correct side of the radiograph. Malformation of the tricuspid valve (see above). There are several conditions that affect the great arteries (e.g., double aortic arch, aberrant subclavian artery) that often result in problems with the trachea and breathing. Defect in the development of the left heart such that it is hypoplastic (under developed). Failure of the ductus arteriosus to close on birth. An atrial septal defect in that the foramen ovale fails to close at birth. Defect in that the truncus arteriosus fails to divide. Narrowing of the pulmonary valve that is the key finding in Noonan syndrome. Set of four anatomical abnormalities: pulmonary stenosis, overriding aorta, ventricular septal defect, and right ventricular hypertrophy. Abnormal spatial arrangement of the great vessels (superior vena cava, inferior vena cava, pulmonary arteries, pulmonary veins, and aorta). Partial or total loss of the right ventricular wall. Defect in the ventricular septum that permits blood flow between ventricles. The progression of atherosclerosis (size exaggerated). Diseases of the blood vessels can be multidisciplinary in nature. For example, medical treatment of atherosclerosis tends to be managed by cardiologists while vascular surgery repairs aneurysms and stenotic arteries. Thickening of an arterial wall due to increased cholesterol and macrophages (see above). Balloon-like bulging of arteries (also possible of the heart: see ventricular aneurysm above). Aneurysm of the aorta, typically of the abdominal aorta (abdominal aortic aneurysm or AAA). They are associated with a smoking history and in connective tissue diseases (e.g., Marfan syndrome, Ehlers-Danlos syndrome). Current USPSTF recommendations are for a single abdominal ultrasound screening for a AAA in anyone 65 or older who has smoked. Surgical repair of a AAA is advised after it is larger than 5.0–5.5 cm because of concern for rupture that leads to death from internal bleeding. Aneurysms of the arteries in the brain most commonly affect the anterior cerebral artery. Rupture of the aneurysm results in a subarachnoid hemorrhage and a very severe headache. Dissection along the length of the aorta between the layers of the aortic wall. Dissection of the ascending aorta (type A) is a surgical emergency while dissection of the descending aorta (type B) can possibly be managed medically. Dissection of the ascending aorta is an emergency because dissection may interrupt coronary blood flow and blood flow to the brain, neither of which tolerate ischemia particularly well. Frank rupture of the aorta is often fatal from internal bleeding. Rupture of the aorta can occur at the sites of aneurysm, but is also due to trauma and results in a traumatic aortic rupture. Narrowing of the carotid artery, typically due to atherosclerosis. Dissection along the length of the carotid artery between the layers of the carotid wall and filled with blood. Formation of a thrombus in a deep vein, commonly in the legs that may break loose, travel to the lungs, and occlude blood flow (pulmonary embolism) sufficient to interrupt oxygenation to the body. A DVT due to being sedentary during air travel. Disease of capillaries in which the walls become thick and weak, and result in bleeding and decreased blood flow. One very common cause is diabetes mellitus in which microangiopathy results in diabetic nephropathy, diabetic retinopathy, and diabetic neuropathy. Veins that have become enlarged and tortuous with failed valves, commonly in the legs. Vericose veins have cosmetic concerns, but they may become painful. Surgery and sclerotherapy are two options for treating varicose veins. Inflammation of blood vessels (veins & arteries) with a long list of causes. Inflammation of the aorta that can be seen in giant cell arteritis, polymyalgia rheumatica, rheumatoid arthritis, syphilis and Takayasu's arteritis. Affects small-sized vessels that often initially presents with oral aphthous ulcers, genital ulcers and uveitis, and can be fatal from ruptured aneurysms. Pericarditis is commonly seen with Behçet's. Affects small- & medium-sized vessels that often affects lungs, kidneys, & heart in those with a history of airway allergic hypersensitivity and p-ANCA antibodies. Affects medium- & large-sized vessels of the head, typically branches of the external carotid artery and namely the temporal artery. Occlusion of the ophthalmic artery results in blindness. Suspicion of GCA necessitates immediate treatment with glucocorticoids and temporal artery biopsy. Affects small- & medium-sized vessels that often affects the lung & kidneys (RPGN) with classic saddle nose and c-ANCA antibodies. Affects small-sized vessels and produces palpable purpura and proteinuria from immunocomplex (IgA) deposition. Affects medium-sized vessels mostly seen in young children with myocarditis, & pericarditis, and is the most common cause of acquired heart disease in children (results in coronary artery aneurysms). Myocardial infarction from coronary thrombosis is the most common cause of death from Kawasaki disease. Affects small- & medium-sized vessels that is strongly associated with tobacco products. Pain, diminished pulses, gangrene and eventual amputation of affected hands and feet. An example of a drug-eluting stent. This is the TAXUS Express2 Paclitaxel-Eluting Coronary Stent System, which releases paclitaxel. Coronary artery disease is not currently reversible and eventually requires surgical management if it progresses. Grafting an artery or vein from elsewhere to bypass a stenotic coronary artery. Performed by cardiothoracic surgeons, a sternotomy is performed to open the chest and then grafts are performed. Cardiopulmonary bypass may be necessary. The internal mammary artery or saphenous vein can be used as grafts. The grafts are used to provide an alternate path for blood flow around a stenosis. Pneumatically assisting the heart to move blood using inflatable cuffs on the legs. Procedures to treat stenotic coronary arteries by accessing through a blood vessel. Angioplasty in this manner is PTCA (described below) but may also involve the insertion of stents to keep vessels open. Insertion of a catheter through the skin ("percutaneous") into a blood vessel ("transluminal") to enlarging the lumen of a coronary artery by forcibly expanding it with a balloon ("angioplasty"), hence the name. It is a form of PCI and generally what is implied when referring to "PCI." Enlarging the lumen of an artery by removal of atherosclerotic plaque by means of catheterization. This is in contrast to angioplasty that does not remove the plaque but merely pushes it out of the way to increase the lumen size. This method is primarily used in peripheral disease, but has been used for coronary disease as well. Enlarging the lumen of an artery by removal of atherosclerotic plaque by means of open surgery. This is primarily done on the carotid arteries (Carotid endarterectomy or CEA) but was first performed on the superficial femoral artery. While not performed on coronary arteries, it is mentioned here for completeness. Enlarging the lumen of an artery by forcibly expanding it with a metal wire tube by means of catheterization. Typically, the artery is expanded first through angioplasty (see PTCA above). Acoustic device for hearing internal sounds including heart sounds. The stethoscope is the quintessential medical icon, regardless of specialty. 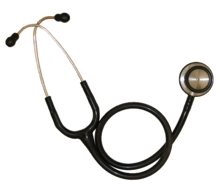 Modern stethoscopes can have a diaphragm and a bell, and be sized for adults or children. In cardiology, it is primarily used to listen to heart sounds it can also be used to listen for bruits (carotid & renal for renal artery stenosis), bowel sounds, and lung sounds. Electronic stethoscopes can amplify and record sounds. A type of divider caliper that can be used to measure intervals and compare intervals on EKGs. Special rulers can be used to measure the intervals as well. An implanted electrical device that replaces the heart's natural pacemaker. Electrical devices to alter the heart's rhythm with electrical energy. As the name implies, a defibrillator is used to stop fibrillation of the heart. It can be used to cardiovert atrial fibrillation if certain conditions are met, but is mainly used to cardiovert ventricular fibrillation which is life-threatening. Contrary to popular media's use, a defibrillator cannot and should not be used for asystole (a "flatline") as it has been shown to be ineffective in restoring a rhythm. If a person is in a rhythm not convertible by a defibrillator, then cardiopulmonary resuscitation (CPR) or more advanced care should be started. An external defibrillator that is commonly found outside of health care settings and is often designed for anyone to use through verbal instructions. AED's have increased in popularity and dispersal so that people with cardiac arrest in public can be cardioverted to a safer rhythm before help can arrive. An implanted device to prevent life-threatening conditions (e.g., ventricular tachycardia, ventricular fibrillation) in people predisposed to these rhythms. An internal pump that wholly replaces the pumping action of the heart. External pump to take over the function of both the heart and lungs. Commonly used in cardiothoracic surgery when the heart is being operated on for such surgeries like open valve replacement or CABG on the posterior side of the heart. The bypass machine is responsible for oxygenation of blood, removal of carbon dioxide, heating the blood (heat is lost from being outside the body) to maintain core body temperature or cooling blood for controlled hypothermia, and providing volatile anesthetics (e.g., isoflurane) if the lungs are not ventilated during bypass (the movement can be problematic while performing surgery). A cardioplegic solution is used to stop the heart from beating and combination with hypothermia reduces oxygen demand of the heart significantly (>97%) such that surgery is possible without causing damage. A balloon placed in the thoracic aorta to supplement cardiac output from the heart. It pulsates opposite to the heart such that it inflates during diastole and relaxes during systole. Deflation during systole decreases afterload (vacuum effect), thus decreasing myocardial oxygen demand, and inflates during diastole to increase diastolic pressure which increases coronary artery perfusion of the endocardium (the heart perfuses itself during diastole, not systole). Internal pump to supplement or replace the pumping action of a ventricle. Can be referred to RVAD or LVAD depending on if it's attached to the right or left ventricle. Various cardiology diagnostic tests and procedures. Current prevailing hypothesis is that LDL cholesterol is "bad" and HDL cholesterol is "good." When skeletal muscle injury is absent, CK-MB is fairly specific to myocardium injury. The troponin complex is present in skeletal and cardiac muscle, but cardiac-specific forms of troponin I and troponin T are used as sensitive & specific indicators of heart damage if acute coronary syndrome is suspected. The presence of troponins are not exclusive to myocardial infarction, and so other conditions should be considered (e.g., heart failure, cardiomyopathies, trauma, defibrillation, cardioversion, ASD closure, radiofrequency ablation, toxicity from chemotherapy, snake venom, cyanide poisoning, ascending aortic dissection, stroke, seizure). Ultrasonography of the heart to inspect chambers, valves, and blood flow. Often utilizes the Doppler effect to determine blood flow through valves (stenosis & regurgitation) and through the septum (ASD & VSD). Agitated saline can be used as contrast for blood flow and microbubbles for capillary blood flow contrast. Echocardiogram of the heart through the thorax external to the body. Much easier to perform than TEE because it is non-invasive and takes less time, but has several disadvantages (namely clarity of images). Echocardiogram of the heart through the esophagus. TEE can require sedation or general anesthesia and the patient must be NPO. Magnetic resonance imaging (MRI) of the heart that utilizes the ECG for gating and to look at specific mechanical functions of the heart. Testing of the cardiovascular system through controlled exercise or drugs. Listening to sounds (e.g., heart sounds) with a stethoscope. Measurement of the electrical activity of the heart, typically with 4 or 10 electrodes on the skin. Portable ECG device for continuous monitoring. Studying the electrical activity of the heart through the use of catheters placed in the heart via veins or arteries. Blood pressure cuff used to measure arterial blood pressure. Testing for biomarkers in the blood that may indicate various conditions. Catheterization of the coronary arteries. Testing the blood flow through a stenosis of a coronary artery to determine the perfusion of the heart. Ultrasonography of a coronary artery. Testing through the use of optical scattering for coronary artery disease. There are several classes of pharmaceutical drugs used in cardiology to manage various diseases and a lot of drugs have cardiovascular side effects. Drugs that manipulate the cardiovascular system do so through several ways. The first is ion channels, which are often manipulated to manage arrhythmias. The second is receptors of various types. The third is manipulation of enzymes. Specifically, types I, III, & IV manipulate ion channels while the others are not. The adrenergic receptor is a set of receptors that are commonly manipulated. Four properties of the heart — chronotropy, dromotropy, inotropy, & lusitropy — are manipulated by adrenergic receptors. For example, the β1 receptor increases all four of these properties: chrontropy at the SA node, dromotropy through the AV node, inotropy of the cardiomyocytes through increased calcium, and lusitropy through phosphorylation of phospholamban. Catecholamines are a set of drugs and hormones that manipulate the adrenergic receptors. The natural catecholamines are norepinephrine, epinephrine, and dopamine. There are numerous other drugs (e.g., dobutamine, ephedrine, isoproterenol) that manipulate the adrenergic receptors and have variable specificity for the receptors and are, thus, used for various reasons. Angiotensin II receptor antagonists (ARBs) block the angiotensin II receptors that are linked to hypertension and heart failure, mainly through vasodilation & heart remodeling inhibition. ACE inhibitors works upstream from angiotensin II receptor antagonists and have similar effects on management of hypertension and heart failure. Sodium nitroprusside and nitroglycerin function by causing vasodilation through nitric oxide, which manipulates cGMP levels through guanylate cyclase. COX inhibitors (namely aspirin), warfarin, direct Xa inhibitors, direct thrombin inhibitors, heparin, low-molecular weight heparins, antibodies (e.g., abciximab), and a few others are used for anticoagulation therapy. This is important in those predisposed to blood clots (e.g., Factor V Leiden) but also for thrombus formation when an atherosclerotic plaque rupture that would, otherwise, lead to myocardial infarction. Numerous drug classes have well-known cardiovascular side effects. As a general rule, all agents used in anesthesia have depressant effects on the cardiovascular system with notable exception of ketamine. Doxorubicin is one agent known to have heart toxicity (leads to dilated cardiomyopathy). The primary effect of diuretics is removal of intravascular volume, which then has secondary benefits to the cardiovascular system in diseases like heart failure. Teratogenic effect of causing Ebstein's anomaly in mothers taking lithium. Toxicity causes arrhythmias including sinus tachycardia, junctional rhythms, and trigeminy. SSRI's also have interactions with anti-coagulation therapy and increases the risk of bleeding while on them. Due to manipulation of norepinephrine, SNRI's can cause hypertension and so hypertension should be reduced before starting an SNRI. TCAs behave like type Ia antiarrhythmics and could terminate ventricular fibrillation and decrease contractility. They can also cause tachycardia and hypotension. ↑ "Cardiovascular Disease | Internal Medicine Subspecialties | ACP". www.acponline.org. Retrieved 21 October 2016. ↑ "What is a Cardiologist?". www.cardiosmart.org. Retrieved 21 October 2016. ↑ "Specialties & Subspecialties". American Osteopathic Association. Retrieved 23 September 2012. ↑ Murphy, Anne M. (2008-07-16). "The Blalock-Taussig-Thomas Collaboration". JAMA. 300 (3). doi:10.1001/jama.300.3.328. ISSN 0098-7484. ↑ Bhat, Venkatraman. "Illustrated Imaging Essay on Congenital Heart Diseases: Multimodality Approach Part III: Cyanotic Heart Diseases and Complex Congenital Anomalies". JOURNAL OF CLINICAL AND DIAGNOSTIC RESEARCH. doi:10.7860/jcdr/2016/21443.8210. ↑ Pagidipati, Neha Jadeja; Gaziano, Thomas A. (2013). "Estimating Deaths From Cardiovascular Disease: A Review of Global Methodologies of Mortality Measurement". Circulation. 127 (6): 749–756. doi:10.1161/CIRCULATIONAHA.112.128413. ISSN 0009-7322. Retrieved 23 September 2016. Look up cardiology in Wiktionary, the free dictionary.